By LUDWIG VON KOOPA - Assuming we can actually find out the time of the Closing Ceremonies. Well, this weekend, the PyeongChang 2018 Winter Olympics will end. Thank you for choosing KoopaTV as your source for 2018 Olympics coverage. You know, between the Olympics Opening Ceremony and...well...that's it. But man, what a reaction log that was. We'll be doing a reaction log for the Closing Ceremony as well, though we have one problem. We don't know when the hell it'll actually be broadcast. Thanks a lot, NBC. According to CBS Sports, it'll broadcast at “6 a.m. ET OR 8 a.m. ET (tape)”, and that capitalised OR makes me feel like no one knows what the hell is going on. CBS Sports's video on that page is about the sport known as CURLING, which is a sport I know nothing about, but apparently it's some kind of meme and it got a respectable third place in the recent GameFAQs poll of favourite winter Olympic sport to watch. Update 2/24/2018: They will re-air the Closing Ceremony (with NBC commentators) at 8 PM Eastern, and the United States won the gold medal for Men's Curling. Per CBS, the United States is actually in the finals for Men's Curling this year, which is significant and rare. I won't watch it. Appropriate for the cold Winter Olympics, it's Ice Curling! 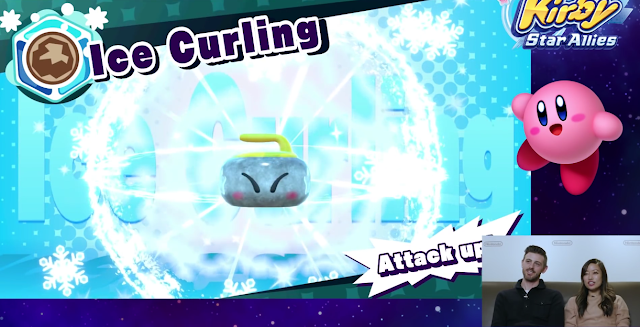 When you combine Ice and Stone in Kirby Star Allies, you get Ice Curling. It apparently raises Kirby's attack power. The same combination (Ice + Stone) in Kirby 64: The Crystal Shards gave you the Curling Stone. This has much higher production values though. Not appropriate for the Winter Olympics given yet another Russian doping story (this time in Curling), it's Clean Curling! Clean Curling does the exact same thing as Ice Curling, though. Same Attack up! boost, and pretty similar curling stone graphic. How varied are these combination abilities going to end up being, I wonder? It's trivial to fill out the combinations if they are just swaps of one another, after all. At some point, the developers run out of creativity and they're just checking the boxes. I never did want this ability combination stuff back from Kirby 64. Not because I hated it, but because it ended up actually limiting creativity rather than enhancing it. Still, even if the curling abilities in Kirby Star Allies all end up being clones, it's still more thrilling than watching curling the sport. KoopaTV managed to figure out the Closing Ceremony time, and live-reacted to it here! 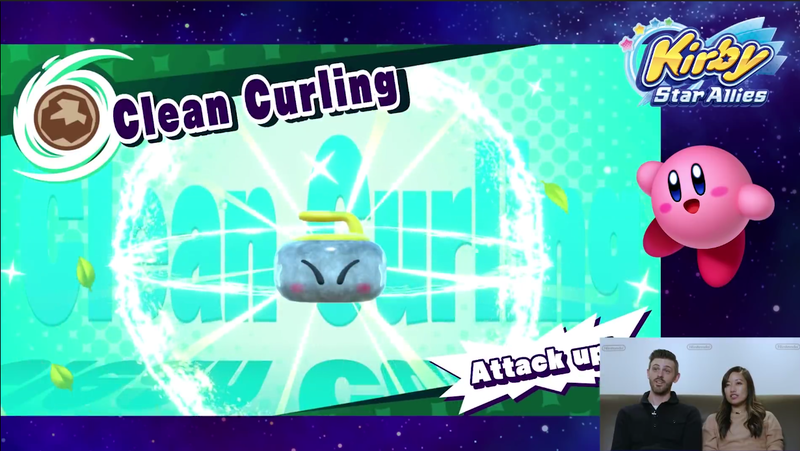 The curling action continues with Kirby Star Allies. This isn't close to the amount of curling in that game! The curling abilities did end up being clones, but Kirby Star Allies really is thrilling, and released. Kirby Star Allies featured creative uses for abilities, which Ludwig wrote about in his review here. I believe I said my opinion on NBC, and it's unfortunate that there's nothing we can do. However, I think I'll watch the Closing Ceremony through BBC via a VPN. Wish me luck! Wanna hook us up on that? Well, according to BBC, it's gonna start at 11 and end at 13 (U.K. military time) Sunday, which is simply 6 AM here in the East. I'm going to try to find a VPN that has its servers out in the U.K., so I can watch the livestream without being neglected viewership. I find it hard to believe that the only time NBC will show the Closing Ceremony is very early inn the morning, after they gave the Opening Ceremony primetime coverage (as a repeat of when it happened early in the morning). Someone ain't tellin' us stuff. I do, or used to. I'm thinking of reinstalling Betternet. ...Would that work to get you in the UK?